Creatine supplementation has been shown to increase strength, power and exercise capacity in strength-training individuals, according to New York University Langone Medical Center. But the key to maximizing the benefits of creatine is to focus on what food and drink you're consuming along with the supplement. Consult your doctor before starting a creatine regimen. Consuming the correct dosage of creatine is important to minimize potential health risks, including dehydration, cramping, unwanted weight gain and stomach irritation. The March 2003 issue of the "International Journal of Sport Nutrition and Exercise Metabolism" recommends taking 20 grams of creatine per day for up to one week. After that point, consume no more than 2 grams to 5 grams per day. Talk to your doctor about how long to stay on creatine, as no long-term studies on its safety and efficacy, when consumed over a long period of time, exist. You can maximize creatine intake and minimize side effects by taking creatine with food. A spike of insulin when consuming creatine maximizes its absorption into your body, according to a guide from MuscleandStrength.com. You can achieve an insulin spike by eating a combination of protein and carbohydrates. MuscleandStrength.com suggests consuming 70 grams of carbohydrates to boost insulin levels, and matching your carb intake with protein intake at a 1 to 1 ratio. 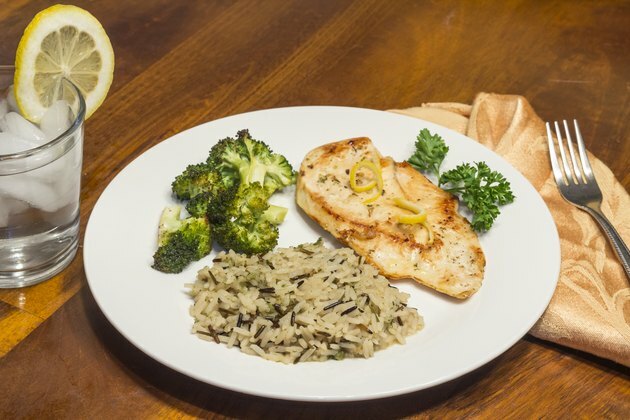 A meal consisting of a chicken breast, serving of rice, vegetable and glass of milk is adequate to boost your insulin levels enough to maximize creatine intake. It may be beneficial to consume creatine alongside your favorite type of whey protein. The two supplements seem to complement each other nicely. A 2001 study published in the "International Journal of Sport Nutrition and Exercise Metabolism" found that consuming whey protein and creatine together produced better results than consuming whey protein alone. Participants who consumed a whey protein/creatine mixture experienced the greatest gain in lean muscle tissue and max bench press abilities over a period of six weeks. The amount of food or drink you consume along with your creatine supplement may vary depending upon your body size and intended goals. Consuming a high-carb/high-protein meal before each creatine dose adds a significant number of calories to your daily caloric intake. If you have a smaller body frame, or are looking to slim down, you may have to adjust the previous recommendations based upon your needs. Your doctor or dietitian can help adjust these recommendations specifically to suit your needs.